I do love publishing my newsletter, and knitting for charities and working in general, but I do relish those little windows of time where I get to decompress and do things at my own whim, instead of following a schedule. You, know, wait to be inspired before I have to write something and taking my time while I do it, or taking a brisk walk because I feel like it, at my own pace, instead of doing it just to stay healthy. You get the idea. Having said that, I am going to seize that very opportunity in a few short days. I will be taking myself to the seashore along with my daughter, son-in-law and the grands. Will it be slow and doing things on my own schedule? Absolutely not! But it is sure to be loads of fun and a time to recharge my batteries. Any time spent with my grands is good time! I hope you all get a chance this summer for a brief respite from your daily duties and obligations and get to do things just because you feel like it – not because you have to. Whatever you get to do, make sure you are kind to each other and help others when you have the opportunity. Let others know how you feel about them too – it will make you feel good as well. You can quickly load multiple documents in one easy step because Word provides a feature to do that that . Rather than double-clicking on a file name, start to create a selection set. If you are selecting sequential files, click on the first file in the sequence, then hold your Shift key as you click on the last. You can add additional files to those selected by holding down your Ctrl key while clicking with the mouse. To remove files from the selection set, hold down the Ctrl key while clicking on a file name you previously added to the set. When you are finished with your list, click Open. Look around and explore in the Open dialog box. You will find it has many of the same options as Windows Explorer as well as a few more. Pay particular attention to the options available on the drop-down list displayed from the Open button (click the down arrow at the right of the Open button). If you adds lines and arrows all the time to flowcharts that you creates in Excel, you may be wondering if there is a way to set a default line weight, color, and arrowhead. Turns out there is! Draw your line or arrow as you normally would. Format the line or arrow so that it appears just as you want it to. Right-click on your line or arrow to display the Context menu. Now, your lines and arrows will be drawn using the formats you made the default for the rest of your current worksheet! There are times when you have to work with data in a worksheet imported from another program into Excel. Normally, it is not a problem to import the worksheet. The problem is that during the process potentially hundreds of extra rows that have no data in them are imported as well. After the import you have to manually delete those extra rows so you can use the rest of the data. So is there is a way to easily get rid of these empty rows? There are different ways you can look at this. The easiest way could be to simply sort your imported data by the column of your choice. All the rows that contain nothing in that column end up at either the end or beginning of the data (depending on if you sort in ascending or descending order) and you can easily delete those rows. When you do a sort in this manner though, you could easily end up with your data out of the original, imported order. If you need the data to be in the original order—but with the blank rows removed— you can just insert a column to the left or right of your data, fill it with sequential numbers, do your sort by any column except that added column, and then delete the rows that are blank (with only something in the numbering column). You can then sort a second time based on the numbering column and your data will be back in its original order. Seems a tad tedious don’t you think? Click F5 to display the Go To dialog box. Click Special to displays the Go To Special dialog box. 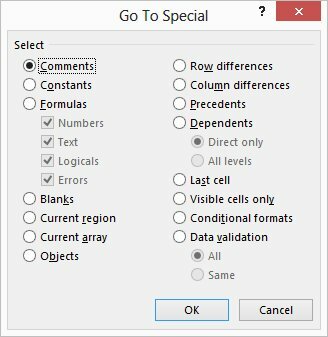 Select Blanks | OK. Excel selects only those cells in the column that are blank. Select Delete from the Edit menu to display the Delete dialog box. Select Entire Row and then click OK.